Mankind has long appreciated Dragonflies and in a number of Asian countries both the adults and the larvae are eaten much in the way we eat prawns. It is the national emblem of Japan, which is often referred to as The Dragonfly Island. 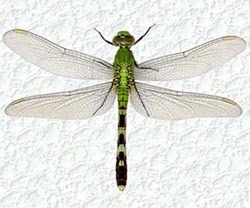 The dragonfly is a flighty, carefree creature symbolizing a whirlwind, swiftness and activity. The dragonfly is an important insect in Zuni legend, where they are shamanistic creatures with supernatural powers. The Navajo word means "which is spread out on water". In their mythology, the dragonfly was harmful to man until subdued by Holy Man. As symbols of water they are frequently depicted around representations of pools in the center of sand paintings. In Japanese mythology, the Dragonfly of the Dead's job was to carry the spirits of the families ancestors to the family during the festival of Bon. They are still much respected in Japan where they are a symbol of playfulness.